When part of the intestine protrudes through an opening in the abdominal muscles. Umbilical hernias are most common in infants, but they can affect adults as well. In an infant, an umbilical hernia may be especially evident when the infant cries, causing the baby’s bellybutton protrude. 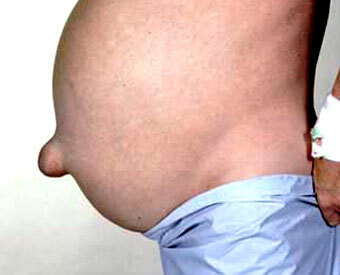 This is a classic sign of an umbilical hernia. Most umbilical hernias close on their own by age 1, though some take longer to heal. To prevent complications, umbilical hernias that don’t disappear by age 4 or those that appear during adulthood may need surgical repair. Umbilical hernia is a common and typically harmless condition. An umbilical hernia can occur in both men and women, and can occur at any age, although it is often present at birth. Umbilical hernias are found in about 20% of newborns, especially in premature infants. Umbilical hernias are more common in male than in female infants; with regard to race, they are eight times more common in African Americans than in Caucasians or Hispanics. While umbilical hernia is not a genetically determined condition, it tends to run in families. In the adult population, umbilical hernias are more common in overweight persons with weak abdominal muscles, and in women who are either pregnant or have borne many children. People with liver disease or fluid in the abdominal cavity are also at higher risk of developing an umbilical hernia. Description Repair of an abdominal hernia involves a cut, or incision, in the umbilical area. Most herniorrhaphies take about two hours to complete. After the patient has been given a sedative, the anesthesiologist will administer a local, spinal, or general anesthetic. The type of anesthesia used depends on the patient’s age, general health, and complexity of the procedure. The incision is usually made underneath the belly button. The herniated tissues are isolated and pushed back inside the abdominal cavity. A hernia repair may be done using traditional open surgery or with a laparoscope. A laparoscopic procedure is performed through a few very small incisions. The hole in the abdominal wall may be closed with sutures, or by the use of a fine sterile surgical mesh. The mesh provides additional strength. Some surgeons may choose to use the mesh when repairing a larger hernia. A hernia repair done with a mesh insert is called a tension-free procedure because the surgeon does not have to put tension on the layer of muscle tissue in order to bring the edges of the hole together.